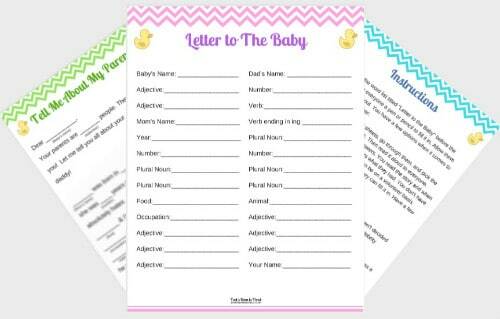 Have your guests write a MadLibs-style letter to your baby! Everyone loves goofy games that make us laugh. This is one of those games. Each guest fills in a noun, verb, or adjective. Then the host reads the letter to the baby about his or her parents asking the guests for their random word answers. Maybe Daddy works as a rodeo clown and Mommy has pepperoni flavored hair. Whoever has the funniest answers wins! "I kept all of these letters for my baby to read when he's older!" - Lauren P.
"My friends are STILL talking about how much fun we had playing this game at my shower, and my daughter is now 9 months old." You want your baby shower to be a fun and unique experience for your friends and family. You, your family, and your friends HATE the standard baby shower games like measuring the belly with string or smelling baby food jars. You love keepsakes but want something more than just a guestbook. These are fun to look back on once your child is old enough to read them. You don't want to spend a lot of money on your baby shower games. This one is only $5 and you can print as many as you need! Get instant access to this awesome baby shower game now! You can download this game right now and print as many copies as you need for your baby shower for only $5. It comes in BLUE, PINK, or GREEN. "I laughed so hard at some of the answers from my aunts. I was NOT expecting that!"